Big Walnut’s Kaley Rammelsberg (13) and Emma Urhammer (3) try and block a shot from Parma Padua Franciscan’s Cami Budzik during Saturday’s Division II state final at the Nutter Center. Big Walnut’s Machaela Podraza (10) hammers home one of her seven kills during Saturday’s state championship match. Big Walnut athletic director Brian Shelton went to place the Division II state runner-up medal around the neck of volleyball coach Ron Lehman after Saturday’s state championship game at Wright State University’s Nutter Center in Dayton and Lehman stopped him. He took the medal and placed it carefully around the neck of Jazmine Reed, one of his four assistants. Reed, like fellow assistants Nicole Casner, Brittany Paxton and Sammie Ebright played for Lehman at Big Walnut. The Golden Eagles weren’t supposed to be in the title game. 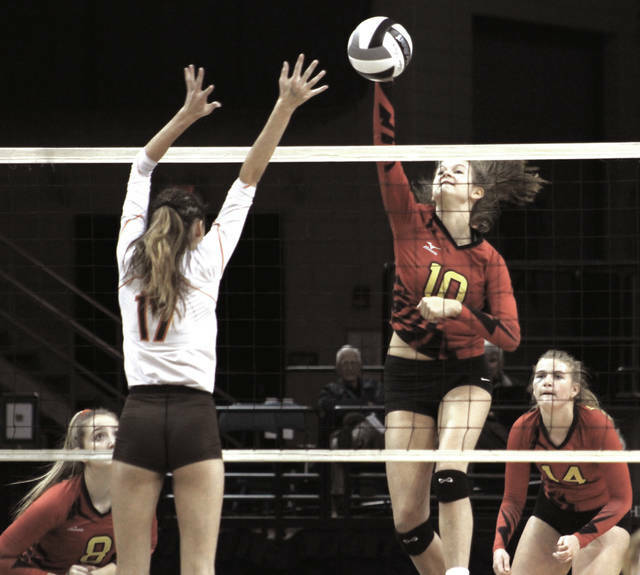 They dug themselves a two-set deficit and had to stave off two match points on the way to a thrilling five-set win in Friday’s state semifinal victory over Kettering Archbishop Alter. Lightening didn’t strike twice, though. 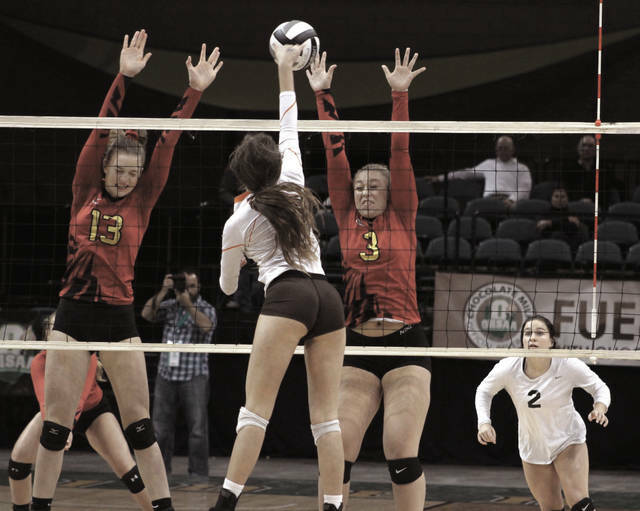 Parma Padua Franciscan was just too much in a 25-20, 25-14, 25-10 win to pick up its second state title in as many years and its fifth overall. The Bruins (25-4) — with titles in 2008, 09, 13, 16 and now 17 — are undefeated in state championship games. BW started strong, building as much as a four-point lead at a couple of points in the opening set. “I thought we came out OK, but our inexperience at being at this level kind of came through as the match went on,” Lehman said. Abby Leigh had six of her game-high 16 kills down the stretch in the first set, including five in an 11-3 run to close out the first-set victory for the Bruins. Ella Mihacevich had 36 assists, Leigh had five assisted blocks and Samantha Ott added nine kills to lead Padua. The Bruins were strong on the receive, accounting for 47 digs as a team. It was particularly frustrating for BW. Machaela Podraza had seven kills and 12 assists to go with six digs and Meredith Thomas had nine digs to lead the Eagles (25-4). Urhammer had five kills, Samantha Bickley finished with eight assists and Kelsie Imertreijs pitched in six digs for BW. The loss capped a season in which BW took home an OCC-Capital title with an undefeated season in the league, a Central District title and a regional championship. Saturday’s loss broke a string of 12 straight wins for the Eagles, who closed the season winning 24 of 26 games after starting 1-2. “To us, making it this far and achieving that many goals, I think is just really amazing,” senior Haley Griffith said.